You are here: Home / Living Room / We have light! Our living room has been in flux for over 6 months now, and it still is no where near done. In fact, not much has changed. 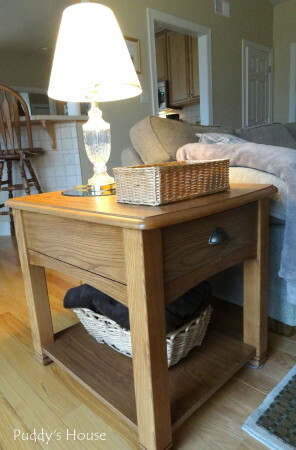 Except, we finally have light on our end table. It is probably not a big deal to most people, but to us it is. Since our living room is open all around, our furniture floats in the room. This meant that we didn’t have anywhere to plug in a light on the end table, so our lights were on the edges of the room. I would actually turn on the kitchen light to be able to sit and read on the couch. So, you might wonder how we finally got light. Well, we had electric outlets added into the floor. This was not a DIY project. There was no way we were messing with electric or drilling holes in our wood floor!! We hired an electrician to come in and do the job. He installed 2 outlets for us. 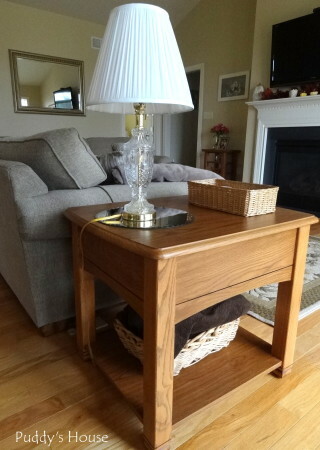 There is an identical one on the other side of the sectional, so that we can add an end table and lamp there too. Fortunately, with the drop ceiling in the basement, the electrician was able to just remove a ceiling tile and access the electrical components from below. Then, he drilled the holes in the floor and added the electrical box. The outlet boxes are specifically designed for floor placement. I have no pictures of the process, because the electrician did it all while we were at work. Very simple and easy process for us. 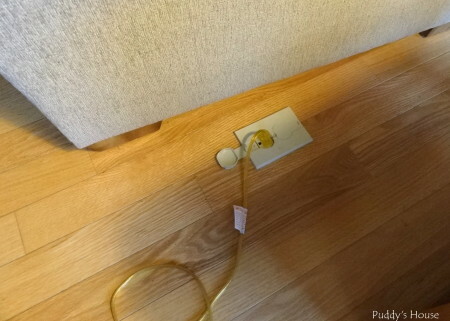 If you are building a house and know that you will need to float your furniture in the room, I recommend getting the outlets put in the floor. Ours are hidden under the sectional…I just moved the couch to take the picture above. 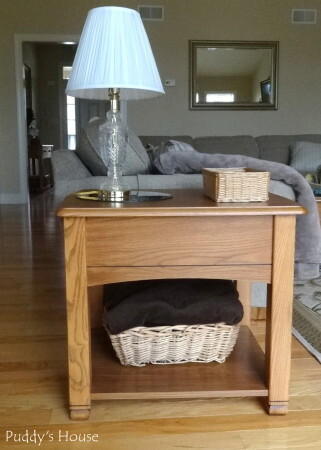 You can’t see any outlets or plugs from this angle, which I just love. If you are really observant, you can see our old rug is still peeking out in the pictures. We still have not been able to find a rug we like!! We are working with an interior designer at the furniture store where we got our couch, so we will hopefully get it all pulled together soon. That’s a story for another day though. For now, we are just enjoying the addition of the light by the couch. It is amazing what a difference such a small change can make. Now, we wonder what took us so long?! Having the lamp just adds so much warmth to the room. I can only imagine what it will be like once we have the rest of the room in order and have a lamp on an end table on the other side of the couch too. Do any of you have furniture that floats in your room? How do you light up your room? Great addition! My parents had these installed in their great room when they built their house. Its a really elegant solution for these larger, more open plan homes. Thanks Darla! Yes, we love the difference it has made.